You are here: Home / Travel / Camping & RVing / Should You Tow a Car Behind Your RV? I’ll lead with the answer: No. You do not always need to tow a car behind your RV. So, how do we come to that decision? 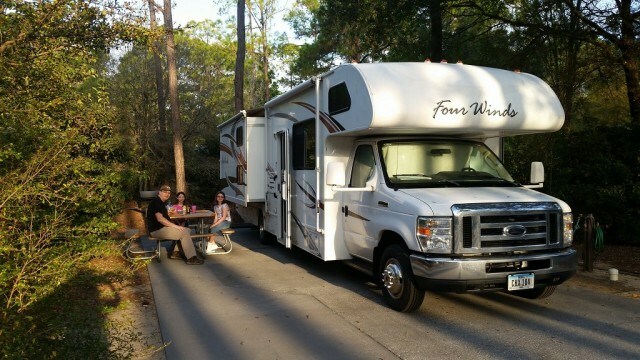 Before we purchased our motorhome we had a small expandable travel trailer. Like all camping vehicles, it had its own drawbacks and benefits. For us, the drawback was towing it with our truck, which wasn’t the most comfortable vehicle for long distance drives. The benefit was that, by default, we always had a vehicle available for off-site explorations. Within days of purchasing our motorhome my husband had made a significant add-on purchase: a Car Tow Dolly. Our tow vehicle is nothing fancy; it’s my husband’s commuter car, a vehicle chosen more for its low cost and fuel efficiency than anything else. Because it is small and light (much more so than my family transporter) it makes a perfect vehicle to tow. But even with the tow dolly and the small, light car we don’t always tow a vehicle when we head out on trips.